In 2015, the hypothyroid drug Synthroid by AbbVie was the most prescribed drug in the United States with 21.6 million prescriptions in a 12-month span. Synthroid is a common brand name of levothyroxine, a synthetic (manufactured in a lab) form of the thyroid hormone thyroxine (T4). Levothyroxine was first made in 1927. Common brand names include Eltroxin, Euthyrox, Letrox, Levaxin, Lévothyrox, L-thyroxine, Thyrax, and Thyrax Duotab in Europe; Thyrox, Thyronorm in South Asia; Unithroid, Levothyroid, Levoxyl, Synthroid, and Tirosint in North and South America; and Thyrin and Thyrolar in Bangladesh. There are also numerous generic versions. If these medications worked for every patient, do you really think there would be over one million hypothyroidism patients following the Hypothyroid Mom Facebook page? The T4 thyroid hormone found in levothyroxine medications must be converted into T3, the potent form that enters every cell in the body and makes the cells of the body function normally. Unfortunately, many individuals are unable to successfully convert T4 into T3 in their bodies, so the patient’s symptoms remain. Natural desiccated thyroid (NDT) is made from the thyroid glands of pigs, which produce thyroid hormones biologically similar to that found in humans. It contains all four thyroid hormones that our bodies make – T4, T3, T2, and T1. Natural desiccated thyroid (brands like Nature-throid, WP Thyroid, Armour, NP Thyroid, and Canada’s “Thyroid” by ERFA) are not commonly prescribed by mainstream doctors and few patients even know they exist. Despite patients reporting improvement in their symptoms, NDT continues to be a challenge to obtain. I’ve heard from countless Hypothyroid Mom readers facing challenges when discussing NDT with closed-minded physicians who insist that synthetic T4-only medications are the only option. I’m asked all the time, “What is the best thyroid medication for hypothyroidism?” I wish there was one simple answer. The truth is the answer is individual. Each person’s body reacts to the different thyroid hormone replacement medication types and brands differently. What may be the perfect treatment for one person may not be for another. That’s part of the reason why thyroid treatment is so complex. What I do know? I would be a very ill woman today if I had not found an open-minded doctor willing to explore all the thyroid treatment options to find what was right for ME. I’m feeling fabulous on NDT after years of struggling on T4-only medications. This groundbreaking study is critical for hypothyroidism patients. We now have research to help back us in our discussions with doctors about thyroid treatment options. I would like to present to you a very important study comparing natural versus synthetic thyroid medications in the treatment of hypothyroid patients titled Desiccated thyroid extract compared with levothyroxine in the treatment of hypothyroidism: a randomized, double-blind, crossover study. This significant study appeared in the Journal of Clinical Endocrinology and Metabolism. It was published in May 2013. Natural desiccated thyroid (referred to as NDT), was compared to Levothyroxine (synthetic T4) in the treatment of hypothyroidism. The objective of this study was to investigate the comparative effectiveness of NDT with synthetic T4 in hypothyroid patients. 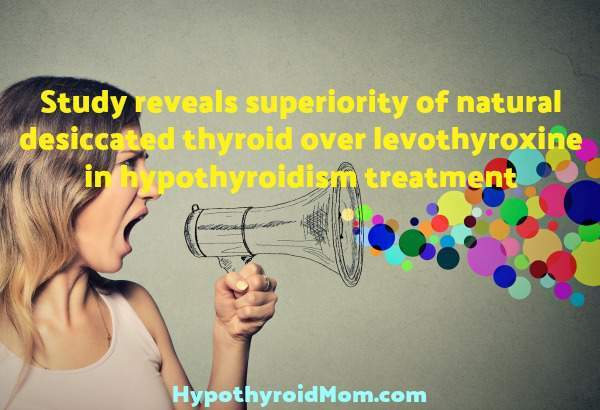 This is of great significance because this is the first prospective, randomized, double-blind, crossover study that compares NDT and Levothyroxine (L-T4) therapy in hypothyroid patients. Seventy hypothyroid patients who were treated with a stable dose of synthetic thyroid medication (L-T4) were included in the study. The patients were randomized to treatment with either NDT or synthetic T4 (L-T4) for a 16-week period. Then treatment was changed to the other thyroid medication for an additional 16 weeks. For example, if a patient took L-T4 for the initial 16-week treatment period, they were switched to NDT for the next 16 weeks. This is the most scientifically valid way to design a study that compares patients’ responses to two different thyroid medications. Blood and cognitive tests, as well as thyroid symptom scores, were administered at the end of each treatment period. The results of this study showed that there was a significant improvement in patients’ symptoms when they were treated with NDT as compared to when they were treated with synthetic L-T4, as measured by the General Health Questionnaire (GSQ-12) and the Thyroid Symptom Questionnaire (TSQ). In addition, patients lost an average of 3 pounds when they were on NDT treatment. Subjective pre-existing symptoms, such as poor concentration and memory, reduced decision-making capability, poor energy levels and insomnia were significantly better while taking NDT. At the end of the study, 48.6% of patients preferred NDT, 18.6% preferred L-T4, and 32.9% had no preference. This study indicates that NDT therapy was superior to synthetic T4 treatment for many hypothyroid individuals. In summary, when treated with NDT, a significant number of hypothyroid individuals experienced better symptomatic relief both in terms of physical and mental symptoms. NDT differs from synthetic T4 in that it contains the additional thyroid hormones: T3, T2, and T1. T4 is a weak thyroid hormone that must be converted into T3 in order to relieve the symptoms of hypothyroidism. T3 is the most potent thyroid hormone that ultimately provides the energy for proper cellular function. T2 is involved in cellular metabolism and is responsible for the weight loss seen in patients treated with NDT. T1 has been shown to enhance electronic transmissions in the brain and may be responsible for improvement in thyroid brain fog, poor memory and depression, symptoms often experienced by hypothyroid individuals. The bottom line is that the symptoms of hypothyroidism are the result of low cellular energy and low cellular metabolism because there is insufficient T3 within the cell. Since between 25%-40% of people treated with synthetic T4 do not adequately convert the T4 into T3, many individuals on synthetic T4 therapy will continue to have the symptoms of hypothyroidism because they have inadequate amounts of T3 within their cells. In fact, the results seen in this study demonstrating the superiority of NDT over synthetic T4 should have even been more dramatic. The patients were actually under-treated with the dose of NDT in this study. The investigators gave 60 units of NDT as an equivalent dose to 100 units of synthetic L-T4. Since a 60 mg tablet of NDT contains 38 units of T4 and 8 units of T3, the equivalent dose of 60 units of NDT should have been 50 units of synthetic L-T4 and not 100 units, as was used in this study! Even when treated with lower than equal doses of NDT (which was really only 50% of the dosage required), a significant percentage of patients experienced improvement in their symptoms and preferred NDT. I am certain that the patients’ responses to NDT would have shown even greater levels of improvement if patients on 100 units of synthetic L-T4 were treated with 90-120 mg of NDT. In my clinical experience, 60 mg of NDT is really equal to 50 mcg of L-T4. There are several “take home” messages that I wish to deliver. #1 Paying attention to a patient’s symptoms is the key to the successful diagnosis and treatment of hypothyroidism. #2 The goal of treatment of hypothyroidism should be the elimination of the patient’s symptoms and not having “ideal” TSH levels. #3 In my clinical experience, NDT is the drug of choice for the treatment of hypothyroidism. This is because NDT contains the additional thyroid hormones (T3, T2 and T1) that are necessary to eliminate the symptoms of hypothyroidism. The dose of NDT should not be determined by TSH levels, but rather by a patient’s symptoms and their clinical responses to gradually increasing NDT dosage. I hope that my discussion of this important study will be of benefit to those of you who are currently suffering with unresolved symptoms of hypothyroidism. Huong, T.D., et al. J Clin Endocrinol Metab. Desiccated thyroid extract compared with levothyroxine in the treatment of hypothyroidism: a randomized, double-blind, crossover study. 2013 May;98(5):1982-90. I recently stopped taking both Synthroid and Cytomel. I was not getting better and cannot seem to get a doctor to prescribe anything else. I to had terrible brain fog, fatigue, put on a ton of weight, couldn’t sleep and could barely function. I am resorting to an natural medication on the internet now and in the last few days, I have actually been feeling somewhat better. I will continue to try to find an endocrinologist that will take my situation more serious and look for an alternative way to treat my hashimotos. With no symptoms I was diagnosed after a blood test with hypothyroidism and given Levothyroxine. At first I had no effect from them at all. Then after about 2 years I started to get some symptoms and assumed my dose needed to increase. I put on weight, had brain fog and total lack of concentration. The doctor said my dose was ok after testing but tested for other things and ended up trying to tell me I was depressed. I wasn’t. During a very difficult time caring for my dying mother I stopped going to doctors and stopped the medication. I had more energy a clear head and lost weight. Later I started taking the medication again and all my symptoms started again. I have now stopped now and just refuse to see my doctor. Why should I take medication that makes me feel ill when I feel perfectly healthy without it? I have fought doctors all my life (73 years) who just had faith in synthetic thyroid. It was very apparent I was T4 intolerant. I even gave up for 10 years and went to alternatives. (Not a suggestion but you can remain fairly functional.) TSH 400 not .402. I believe that some Drs are just lazy. Thanks for being there. THIS is a great travesty in our medical world.